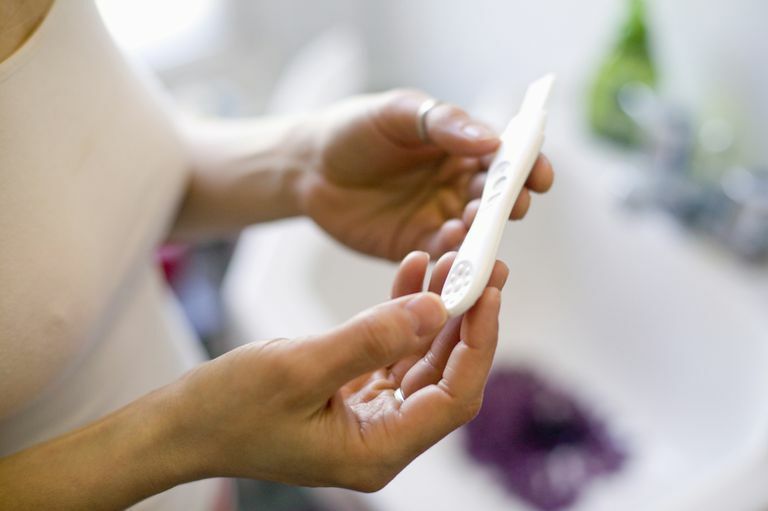 You happened to take a home pregnancy test, and after waiting the allotted time for the result, you notice that the result window shows one single, negative line—that is, until you went back to the bathroom later, glance back at the used test and notice that now the positive line is showing up. What gives? Does that new line mean that you're pregnant? Instructions on most pregnancy tests will tell you to read the results in a certain amount of time, usually from a couple of minutes up until 10 minutes later. So you may take a pregnancy test and read it within the above time period as negative. If you happen to be like many women and keep the test around to look at later, you may notice that after that allotted time, the test now appears to have a positive result. This is called an evaporation line. It is not indicative of a positive pregnancy test. Evaporation lines happen when the urine that was on the test area starts to dry out and evaporate. The chemical composition of that particular urine sample has now changed since that urine sample evaporated, sometimes causing the test to show a positive line. This evaporation line is different from a faint test line (which is a valid positive result) since more time has passed than instructed. If you took the test correctly and followed all of the instructions correctly, you may have noticed a thin, faint line in the test result window of your test after a few minutes of taking the test. You thought the line was too faint to count, but after 10 minutes that line got even darker, so now what? If you are still unsure about the results, try waiting a day or two to take another test in order to verify the result, using a sample from your first-morning urine (which is more likely to have higher concentrations of the pregnancy hormone, hCG). Too early in your cycle to test. If you test earlier than 7 to 10 days past ovulation, then the hCG hormone may not be at a high enough level to produce more than a very faint line. Using a lower sensitivity test. This means that you may need a test with higher sensitivity levels so that you can have accurate results sooner. Too much fluid: You can dilute your urine sample if you are urinating too frequently or drinking too many liquids—this is why first-morning urine samples are recommended for pregnancy testing. Chemical pregnancy: When implantation of a fertilized egg happens, hCG is produced, even though that implantation may be viable. This is called a chemical pregnancy, where implantation happens, but very quickly after, a miscarriage follows. This chemical pregnancy will still create a faint positive line on a pregnancy test. If you had not tested at this point, you might not have known that this kind of non-viable pregnancy had occurred.